There are many tales of how our universe came to be, yet those passed down by the Greeks have resonated for generations. Tales of love, fear, chaos, and power—each speaks to a different aspect of human nature and our relation to the world around us. Embark on a journey where the myths of Ancient Greece come to pass once again. Please support our Kickstarter campaign to help with the costs with the production. Everything helps! EPIC Motion Dance Company is proud to present its fifth annual spring production “επικός (EPIKOS).” Each year our show is a highly-anticipated event that has consistently sold-out, so purchase your tickets early. Join us for a night of inspiration and witness the artistic vision and creative works of our company. Follow the hashtag #EpikosNY on Twitter, Instagram, and Facebook for updates on the show! EPIC Motion Dance Company presents THE DROP 2014—a two-day celebration of dance in its various forms with the purpose of fostering a stronger bond amongst members of the greater New York City dance community. Beginning with a series of classes (the DropShops) and culminating with a showcase featuring dancers from across the greater New York city dance community, THE DROP is an opportunity to interact with our diverse and talented community through both participation and spectation. Only a limited number of tickets will be available at the door. Make your selection and purchase with the drop-down menu and payment button below. Please careful to select the correct showtime and workshop package. If you have any questions or concerns, please contact us at epic.m.dance@gmail.com. Over the past 7 years EPIC Motion Dance Company has grown from a group of college dancers with a desire to do something different into an extensive network of talented dancers and choreographers with a passion to inspire. 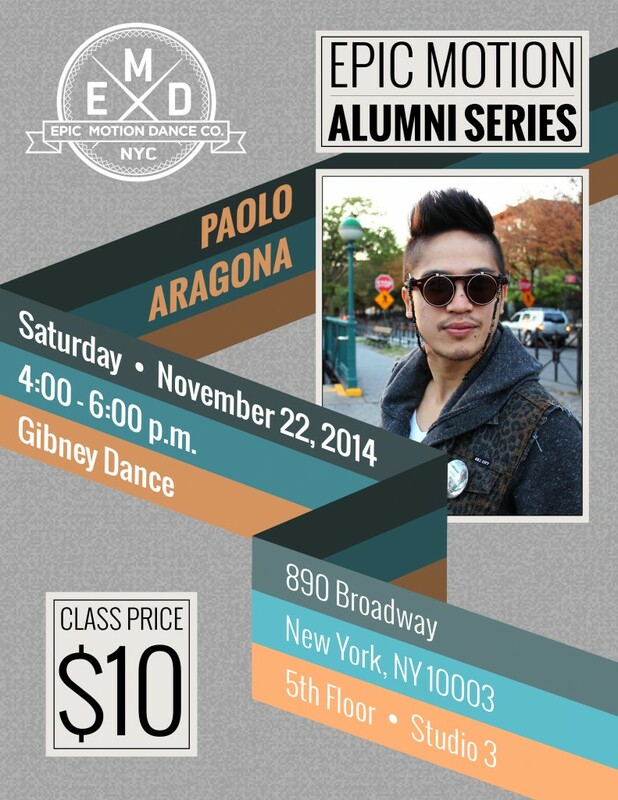 We take pride in our alumni and are pleased to bring back some of the faces of EPIC past through a series of classes. Join us as we welcome back Season 5 alum Paolo Aragona! From emulating MJ as a child in his hometown of Baguio City, Philippines, to the start of his freestyle foundation in popping, locking, and b-boying in high school in the suburbs of Philly, to today—Paolo Aragona’s movement vocabulary is always evolving. While attending university in Philadelphia, Paolo frequented freestyle jams, trained at Koresh Dance and the Funky Sole Fundamentals, as well as experimented with jazz, modern, ballroom, and latin at the University of the Arts and University of Pennsylvania. Shortly after graduating, Paolo moved to New York City and has since trained at Broadway Dance Center, Monsters of Hip-Hop, and industry and community workshops in the tri-state area. A proud member of the east coast dance community, Paolo is no stranger to the stage. He is an alum of EPIC Motion Dance Company and Strictly Funk Dance Company, a former director and alum of iNERT!A Dance Team, and currently a dancer for Funkanometry NY. Some of his notable performance highlights include, the 2014 US Open Opening Ceremony with Fitz & the Tantrums and Rhythm City Entertainment, The Filipino Channel’s One Kapamilya Go 2014 Concert at the Prudential Center, the choreography round of So You Think You Can Dance’s Season 7 New York auditions, Funkanometry SF’s The Sock Hop 6 Showcase, Culture Shock DC’s International Choreographers’ Showcase, and World of Dance NY 2013. Advertising copywriter by day, dancer by night, Paolo is absolutely thrilled to share his imagination and groove with his fellow movers! The beginning of every season is always teeming with excitement and energy for EPIC Motion Dance Company. 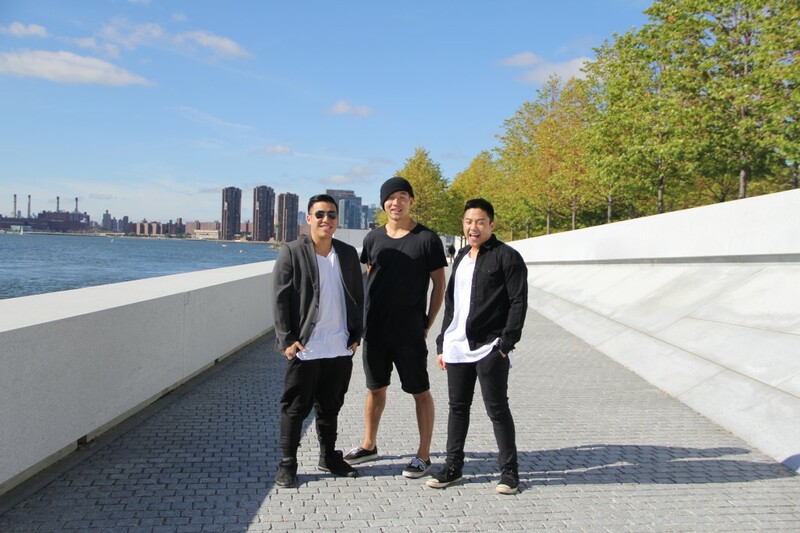 Fresh from this year’s auditions, the team ventured to Franklin D. Roosevelt Four Freedoms Park for the annual photoshoot. Travelers along the East River can spot this hidden gem at the southern tip of Roosevelt Island. The park’s clean, angular aesthetic designed by architect Louis Kahn was an ideal backdrop for edgy, minimalistic concept for the shoot. Shot on a crisp September day, the photoshoot is the vision of Marketing Director Omari Allen and Co-Artistic Director Michael Toy. Check back soon for more photos from the shoot on the website! In the mean time, enjoy a few candid shots from the behind-the-scenes below! Seeking Performers for Community Showcase! PERFORMANCE OPPORTUNITY! 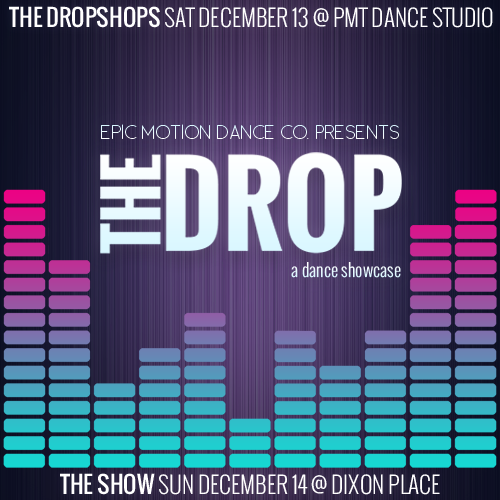 EPIC Motion is seeking organized dance groups and projects from the East Coast to perform at our second community showcase on Sunday, December 14, 2014 at Dixon Place. Our goal with this event is to provide great exposure for all participating performers and feature a diverse lineup of groups and projects in a high-energy setting. This is an unpaid performance, but participants would have the opportunity to perform twice throughout the evening to an anticipated audience of 300 people. While there will be no formal audition, due to space constraints and our desire to present a diverse show there will be a limit on the number of performing groups. This event will also include a series of workshop classes on Saturday, December 13 (location TBD) featuring choreographers from the participating groups. Feel free to also contact us with any question or concerns. We hope you can join us for a weekend of dance and community!